We are 20 years young in 2018, and to mark the occasion we are hosting a gala concert on 27 January. 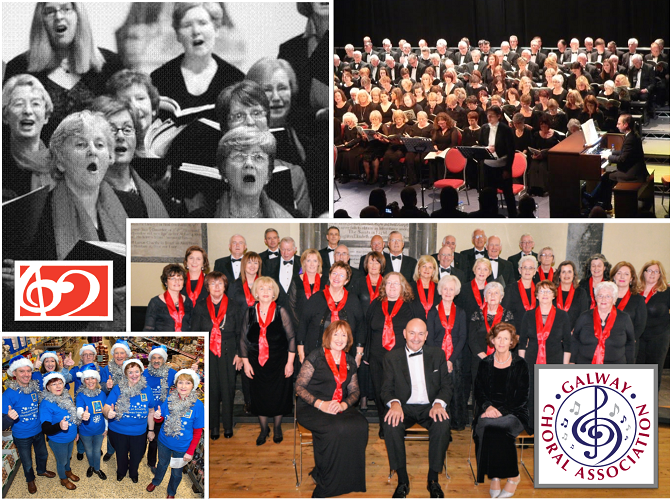 Galway Choral Association in Action: From top left anti clockwise: Lux Hibernae CD launch in 2008, Carmina Burana in Seapoint, 2015, official choir photo 2017, Christmas carols in Knocknacarra 2016. 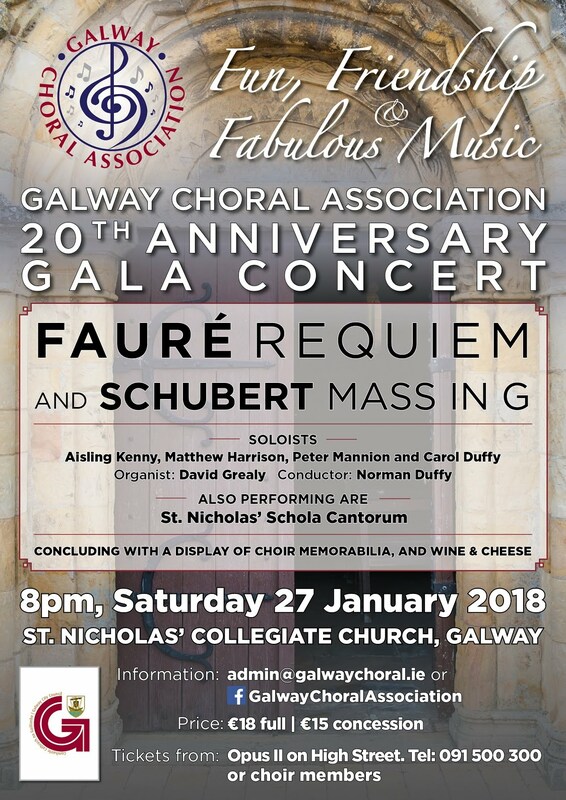 The choir, directed by Norman Duffy, will present Fauré’s Requiem and Schubert’s Mass No 2 in G, with Galway native soloists Aisling Kenny, Matthew Harrison, Peter Mannion and Carol Duffy, accompanied by organist David Grealy. Also performing are a group from St Nicholas’ Schola Cantorum. “We are delighted to be presenting this birthday concert” says Carol Duffy, Chairperson of Galway Choral Association. ”Our first Boys Choir was formed in 1998, and in subsequent years men, women and girls have been added to the groups supported by the Association. Over the years, many people have sung with us, and some have gone on to professional roles in various musical and artistic spheres. “Today we are a 50-voice adult choir, providing a platform for people of all ages who are new to choral singing, as well as many experienced singers. The evening includes a wine-and-cheese reception and a display of memorabilia, introduced by founder member Tom Grealy and his son David – a former Boys’ Choir member who is now a professional organist. All former members are invited to attend, and we look forward to re-kindling old friendships and sharing stories of the many performances and events. Musical director Norman Duffy observed that marking such an important anniversary with performances of these wonderful works showcases the Association's values of Fun, Friendship and Fabulous Music, as well as the skill and dedication of choir members. The concert is being held at 8pm on Saturday 27 January in St. Nicholas’ Collegiate Church. Tickets are €18 / €15 (including the post-concert reception) and are available from Opus II in High St (091 500 300), from choir members or at the door.